Elsewhere on the web-site you will find a general background report on the Assynt Seashore Project which was launched in September 2015. This is an account of some of the finds from three informal outings by Clarinda Chant, Gwen Richards and myself during February 2016. On 3rd, we made a start on the cobbly shore of Inverkirkaig (NC0719), not far off high tide, concentrating mainly on the deep piles of washed-up weed. 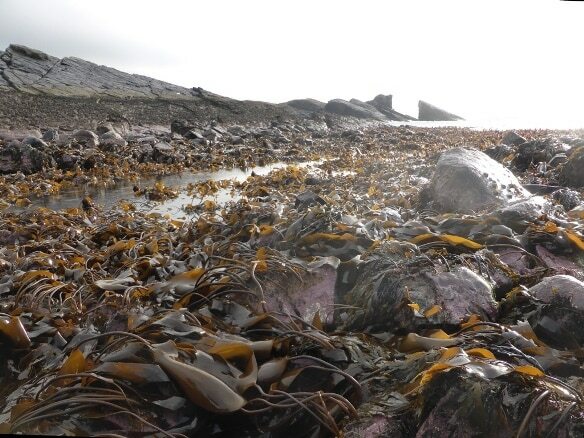 Ten of the brown algae we might have expected to find were present, in varying quantities, with the thick, rough, stiff stems of cuvie Laminaria hyperborea predictably conspicuous. An additional species was landladies wig Desmarestia aculeata, which has fine, much-branched stems, with rows of ‘spines’ down the branches. A flat, neatly-branched fucoid, less chunky than most others, resolved itself into horned wrack Fucus ceranoides, when we found beds of it attached to the substrate at the southern end of the beach, along the edge of the River Kirkaig. This species is tolerant of reduced salinity and is found on many Assynt shores where burns or rivers empty out abut or cross them. Molluscs were few, unsurprisingly on such an exposed shore; they included common mussels, common cockles, edible periwinkles, and the remains of one of the larger ‘spoots’ or razorshells, for which this bay has been famed in the past, probably the pod razorshell Ensis siliqua. The only other finds were a mermaid’s purse, the egg-case of the lesser-spotted dogfish Scyliorhinus canicula, and fine threads attached to a washed-up frond of sea belt Laminaria saccharina. These resolved themselves, under the microscope, as stems of the hydroid Obelia geniculata; the specific name, meaning ‘kneed’, reflects the zig-zag shape of its colonies. Nothing especially memorable, but a useful opener. On 6th, Gwen and I had a look at the beach at Culkein Stoer (NC0333) on a receding tide. All the predictable brown algae were present, either in the wash-up or attached to bedrock, including horned wrack, again where a burn disgorges itself from under the road. The wash-up also included the remains of a lumpsucker Cyclopterus lumpus. We therefore concentrated on the molluscs, both alive and as shells along strand-line. A number of the empty shells of flat periwinkle were collected, since there are two closely related species. Both the slightly more domed Littorina obtusalis and the much flatter L. mariae (L. fabalis in some books) were present in a variety of plain colours, including everyone’s favourite yellow or orange, and also stripes; L. mariae was the less common of the two. We found some shells difficult to assign confidently to either species, and they do also need to be mature. We also had the two commonest top shells, the grey Gibbula cineraria, with narrow bands and the flat G. umbilicaris with broader purplish bands. Common limpets Patella vulgata were identified from live material (you need to see the colour of the gills, tentacles and feet) and then returned to the shore. That visit added something to our skills, although the distinctions between the rough periwinkles Littorina saxatilis and L. rudis still elude us. On 10th, Clarinda, Gwen and I took advantage of another bright day amongst the downpours to have a look at two beaches at Clachtoll. The southern sandy one (NC039270) had the usual suspects in the wash-up, and a frond of one of the kelps was covered in the whitish, empty, skeleton of sea-mat Membranipora membranacea, but there were virtually no shells. We then ventured out onto the ribs of Torridonian sandstone at the north-western end of this beach, where pools provided us with some new attached seaweeds, including sea oak Halidrys siliquosa, the first dabberlocks Alaria esculenta we have come across and the furry green velvet horn Codium cf. tomentosum. 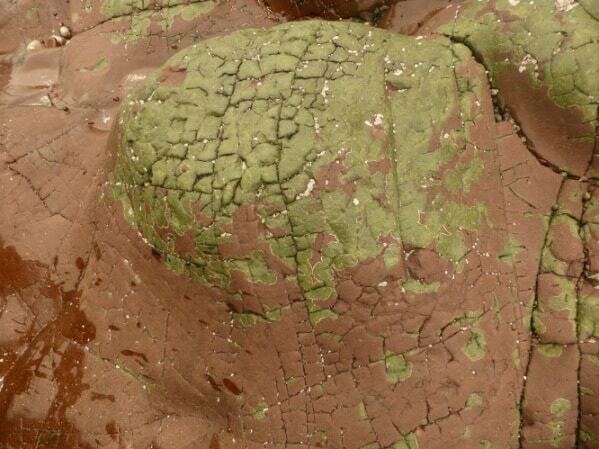 There were also boulders at mid-tide level draped with laver Porphyria umbilicaris. Further exploration of the Torridonian bedrock higher on the shore took us into the lowest part of the lichen zone, with green patches of Verrucaria mucosa ornamenting intriguing criss-cross fissures in the bedrock, which are apparently known to geologists as ‘Frankenstein’s stitches’ (Photo 1). We also noted serrated wrack F. serratus well down on the shore, as the tide receded; we had not seen it in the wash-up. After lunch, we explored the northern bay, where the salmon netters used to draw up their boats (NC037372) and this proved really interesting (Photo 2). Assorted shells in sandy wave-like depressions running across a sandy area included those of our first cowries (Photo 3). There are two species of cowries in British waters, distinguished mainly by spots on the living animal, which show through the shells, but fortunately the size of the largest put them definitely into the species Trivia monacha. 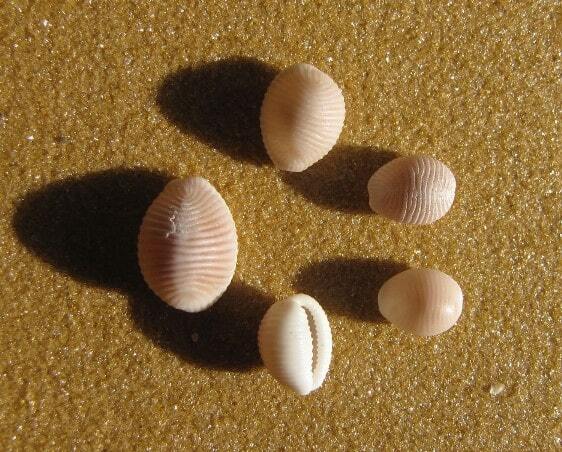 Cowries are also known from a beach near Clashnessie, but do they occur elsewhere along the Assynt coast? There was, for the first time, a reasonable assortment of the shells of bivalve molluscs, including more robust species, such as pullet carpet shell Venerupis senegalensis, rayed artemis Dosinia exoleta, striped venus Chamelea gallina and thick trough shell Spisula solida, and the much more delicate shells of the sunset shell Gari tellinella. 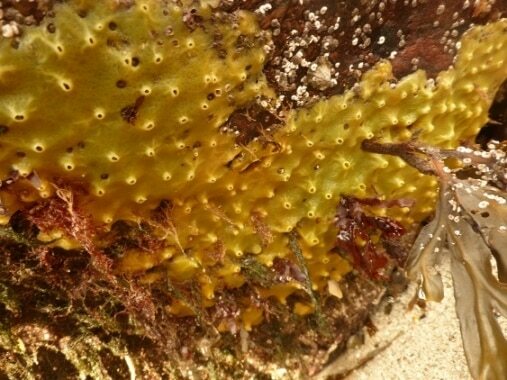 Other creatures noted, a little lower down the shore, included tiny hermit crabs inside flat periwinkle shells, one of which (sacrified in the cause of science) proved to be the species Pagurus bernhardus, and a compact orange growth on a boulder, which may prove to be the sponge Suberites ficus, otherwise known as the sea orange. 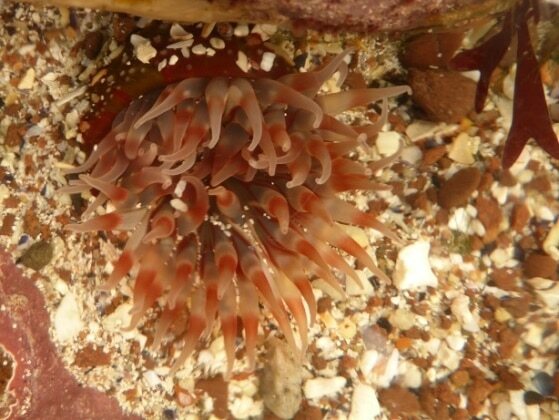 Meanwhile, Gwen had been photographing the inhabitants of small pools and the underside of boulders, adding the dahlia anemone Urticina felina (Photo 4) and breadcrumb sponge Halichondria panicea (Photo 5) to our tally. 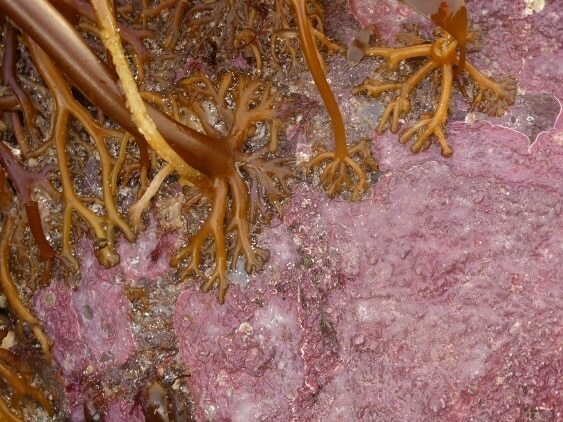 We also noted lovely pink coralline algae (Photo 6) encrusting the rocks, but did not attempt to put name to them; that is a job for the expert. 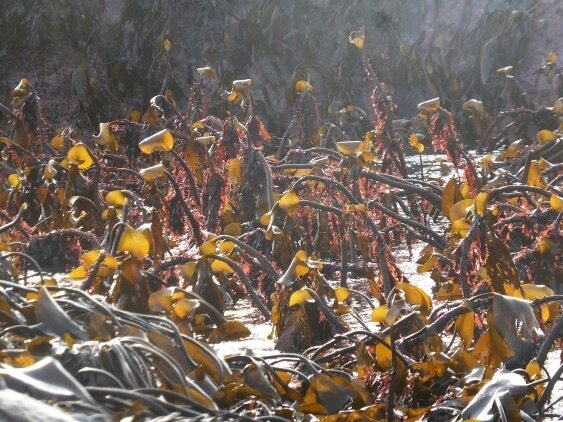 As the tide receded, we followed it down into the kelp, where, in the afternoon light, we were treated to the sight of back-lit upright stipes of cuvie (Photo 7), ornamented with ragged pennants composed of an assortment of red seaweeds. Most were situated in water too deep for us to reach, but we were able to identify one of the largest as dulse Palmaria palmata. In the sample of this I brought back were two individuals of an isopod crustacean (the same group as the terrestrial woodlice) called Idotea granulosa. So, a real feast, both amongst our target groups, and also those into which we had agreed not to stray, but could not resist! To conclude, a word about books. James Merryweather’s User-friendly Seashore Guide (Blue-Skye Books, 2014) is certainly the most accessible introductory text. However, we did find two of the heavyweights useful. For the algae, the beautifully illustrated Seaweeds of Britain and Ireland (Wild Nature Press, 2012), is really comprehensive and excellent. For the molluscs, the massive Handbook of the marine fauna of North-West Europe (Oxford University Press, 2012) is indispensable, with detailed line drawings of all species.